Like always we want to be as transparent as possible and show you that there is a reason why our coffees cost a bit more. In the photo above you can see all the prices we paid for our coffee in 2016. The prices are per pound (lb=453g) of green coffee Free on Board (FOB), which means the price for the coffee packed and stacked in a container delivered to the ship. What the farmers are paid from the F.O.B price will vary from country to country depending on the trade structure, but as an example we have illustrated this in our 2015 Transparency report. In addition to the F.O.B price we pay for the green coffee we also have to pay for shipping, insurance, financing, logistics and production costs which adds to the price we are charging for the coffees. Of course our production costs are higher than for instance a big supermarket coffee brand as they can roast up to 60.000 kg of coffee per day whereas we normally would roast 200 - 400kg in a day. You may notice that the average price we paid per lb is slightly higher in 2017 (5,78 USD) than in 2016 (5,08 USD). There are several reasons for this. We bought a lot more Geisha coffee from the Caballeros and although the price was slightly lower we bought a significant higher amount in 2017. Also most of the Kenyan coffees were bought for a higher price in 2017 compared to 2016. We are very proud and thankful to our customers that we are able to pay a sustainable price to the farmers we buy from. The average coffee commodity price was around USD 1,50 per lb in 2017 (which has been more or less the same for 40 years). For the coffees we are buying, the commodity price wouldn't even cover the farmer's costs of production and they would not be able to invest in their farms in order to improve the quality of their coffees. 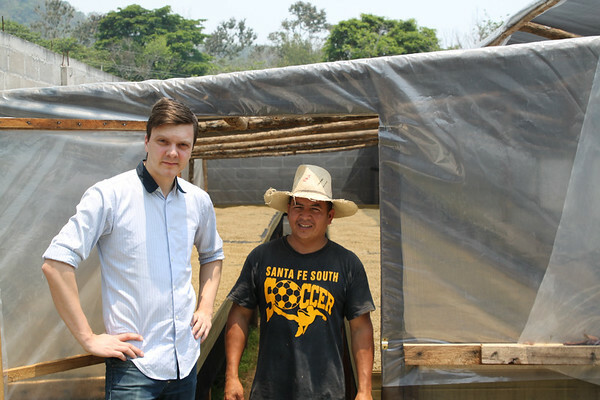 Jobneel the owner of Finca Nacimiento in Honduras is the first producer we started to work with and buy directly from. We are now able to buy the majority of the coffees he produces. As always our main focus when buying coffees is to make sure the trade is transparent and that the farmers get a good price for their coffees. This can be quite difficult in some countries yet very easy in others. For example, it is a lot less complicated to work and communicate directly with a single farmer that has enough land to be able to process and dry his/her own coffee as compared to dealing with cooperatives in East-Africa. The challenge with the cooperatives is not necessarily transparency but that one lot of coffee can consist of coffees delivered by up to several hundred different smallholder farmers. This also makes it difficult to work directly with farmers in order to improve their product at farm level. Until now our volumes have not been big enough to be able to source directly from Ethiopia where we have had to rely on Nordic Approach to help us source good coffees. From all other origins we buy from we source and buy directly from either farmers (Americas) or cooperatives (Kenya). Our ambition for 2019 is to try to find ways we can work more directly in both Ethiopia and Kenya so that we can hopefully have a positive influence on the farmers and the coffees we are sourcing from East-Africa. We strongly believe that paying fair prices to the farmers is the best way of ensuring they continue their hard work and that they are able to invest in producing quality coffee also in the future. Without economic stability they are not able to invest in their farm which we see as crucial for developing the coffee quality. Since we started working directly with a few selected farmers in 2009 we have managed to dramatically improve how they harvest, process, dry and store their coffees which has resulted in much better quality. We have also helped them implement new and exciting cultivars of coffee on their farms which takes 4-10 years to really see the benefits from. We will see a few of these new cultivars, such as SL28, already this year from Nacimiento and Finca Tamana and we are expecting more interesting cultivars from the Caballeros and Los Pirineos in the upcoming years. In other words, we have a lot to look forward to and we could not have come this far without the support from our customers and guests. Thank you.